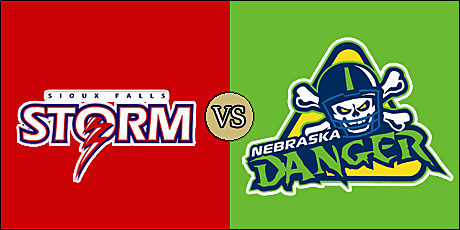 What: Danger welcome an old rival, the Storm, to Central Nebraska. When: Saturday, March 9 at 5:05 p.m. pacific (7:05 p.m. central). 2019 Head to Head: May 18 - Danger at Storm. Note: The Storm defeated the Danger in three straight United Bowls, from 2013 to 2015. The Storm are 1-0 overall and 1-0 on the road. They are coming off a 47-44 road win over the Cedar Rapids Titans on February 23. The Danger are 1-1 overall and 1-0 at home. They are coming off a 53-52 road loss to the Green Bay Blizzard on March 1. Storm K Miles Bergner (#16). This will be the 18th meeting between the teams, with the Storm holding a decided overall edge in the series, 16-1 (13-1 regular season and 3-0 in the playoffs. The Storm are coming off a bye week after squeaking out a 47-44 road win over the Cedar Rapids River Kings in their season opener. The difference proved to be Miles Bergner's 33-yard field goal as time expired. Kurtiss Riggs has been head coach of the Storm during all 17 previous games between the teams. The Storm, who have appeared in nine straight United Bowls, are looking to get back there in 2019. The Danger looked terrific in their season opening win over the Bismarck Bucks, especially in the first half when they jumped out to a 39-13 lead. 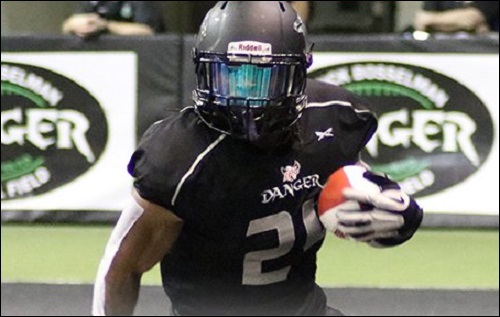 The Danger were in their game against the Green Bay Blizzard until the final minute before falling last week, 53-52 in the closest finish of the young IFL season. Pig Brown is 0-2 against Sioux Falls as head coach of the Danger. The Storm is one of the most veteran teams in the IFL, led by quarterback Lorenzo Brown, Jr. The two-time United Bowl champion threw for 106 yards and a touchdown against the River Kings. He also ran for 41 yards and a score. Darrian Miller was effective in the running game, rushing 12 times for 58 yards and a pair of touchdowns. Wide receiver Brandon Sheperd was Brown's primary target in the opener. He caught seven balls for 86 yards and a score. He also rushed for a touchdown on his only carry of the game. Defensive back DeAndre Scott and linebacker T.J. Neal had nine and seven tackles in the game, respectively, while Charles Williams recorded a sack and defensive lineman Charles Williams recored a sack and recovered a fumble. 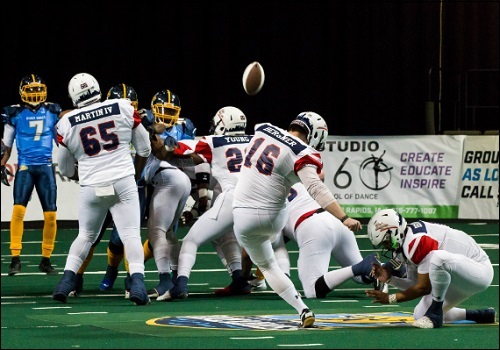 Bergner, one of the more reliable kickers in the IFL, hit all five of his extra point attempts, and has converted on four of five field goal tries with a long of 33 yards. Tommy Armstrong, Jr. has looked good through two games. His six touchdown passes are tied for second in the league. Armstrong has completed 62.9 percent of his passes for 292 yards with a pair of interceptions. He also has rushed 10 times for 96 yards and another two scores. Davonte Sapp-Lynch, brother of Super Bowl champion Marshawn Lynch is third in the IFL with 63.5 rushing yards and second with six rushing touchdowns. Troy Evans, Jr. comes in with seven catches for 86 yards and a touchdown, while Eric Thomas has six grabs for 64 yards and two touchdowns. Gregory Dent, Jr. adds two receiving scores of his own. Defensive back Najee Bright and linebacker La'More Wise have 16 and 14 total tackles, respectively. Defensive backs Jason Baxter and Lavarious Varnado each have an interception. Jerod Haynes is 12 of 16 on point after tries and three of five on field goal attempts. We will have periodic updates of this and our other two games this evening; Strike Force at River Kings and Blizzard at Barnstormers. Tommy Armstrojg with the TD run for Nebraska to make it 7-7 with 6:/0 left in the 1st quarter. Storm score to take a 14-13 with 58.2 seconds left in the 1st quarter. Jerod Haynes with a FG to put Nebraska up 16-14 with 10:35 left in the 2nd quarter. Sioux Falls with a TD to tKe a 21-16 lead with 6:54 left in the 2nd quarter. Miles Bergner FG puts Sioux Falls up 24-16 with just under 10 seconds left in the 2nd quarter. Sioux Falls with a blocked to go up 31-16 on the last play of the first half. Second half is starting. Nebraska ball. Nebraska makes it into the end zone. Storm lead 31-22 with 11:02 left in the 3rd quarter.